Thanks Bill Marler for your offer to support Washington State University’s Common Reading program after it got caught in a recent controversy regarding the book Omnivore’s Dilemma. See also developing Facebook action related to the topic. From his blog, I can tell Marler has some appreciation of Web 2.0 as a life-long collaboration and learning strategy. This whole event is an example of how having a curriculum open to community review can improve learning outcomes. Searching in Google for “WSU Common Reading” shows that the event lit up a problem-solving community with multiple perspectives but overlapping interests in this topic; a community that produced the resources to sustain a learning opportunity. 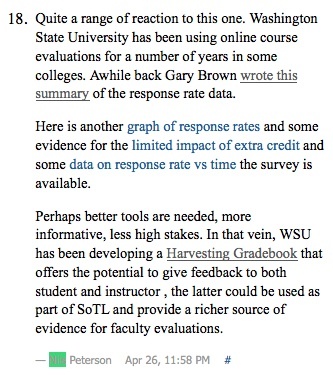 WSU’s Center for Teaching Learning and Technology has been exploring how to help students learn in, from, and with such communities with projects like the Microsoft co-funded ePortfolio Contest. A variety of lessons can be learned from that project, including thoughts on how to transform the traditional gradebook by extending the idea of grading out into the community and making it a process for collecting community feedback on student work, AND the assignments that created the work, AND the program goals that shaped the assignments. I think this represents the way WSU needs to move forward with a Global Campus concept. 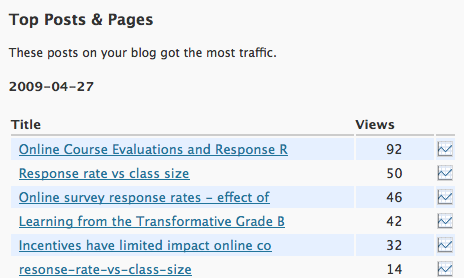 This drove a large spike in readership of the associated resources on April 27. 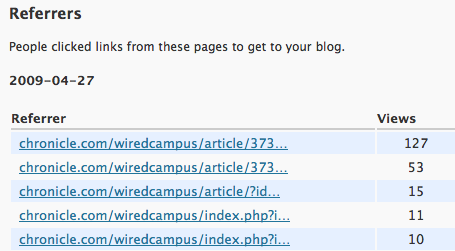 And examining how readers got to the site we see they came from several related pages in the Wired Campus article. You are currently browsing the One small step for man blog archives for May, 2009.